Three big-name developers are partnering to build the “Midline,” a mixed-use project with 1.8 million square feet of development near the Wiehle-Reston East Metro Station. 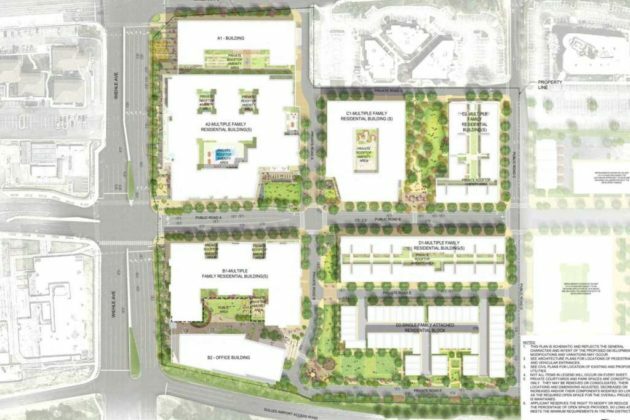 If approved, the project by JBG, EYA and Chevy Chase Land Co. would bring 1.2 million square feet of residential development, a senior living center, 260,000 square feet of office and up to 250,000 square feet of retail to 17.5 acres east of Wiehle Avenue, south of Sunset Hills Road, and west of Michael Faraday Drive. The Fairfax County Planning Commission will vote on the project on September 27. A vote by the Fairfax County Board of Supervisors is likely in October, but an official date has not been scheduled yet. 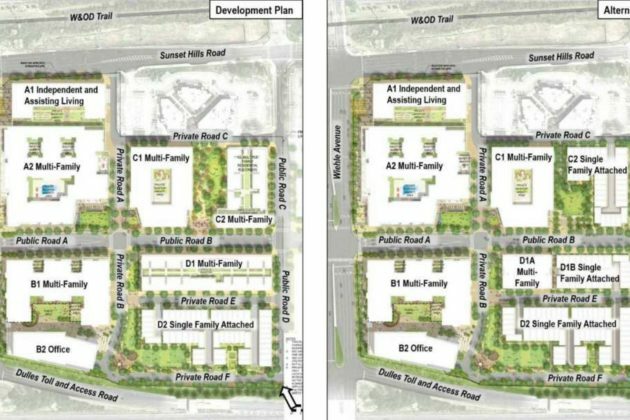 The plan requires redevelopment of four low-rise office buildings and surface parking. Northern Virginia Community College will relocate to 1821 Michael Faraday Drive, two blocks east of the development. Plans for the relocation of Marymount University are not known. Four blocks with several buildings are proposed. Block A would include one building with 127 independent units and a 33-bed assisted living facility. The second building would include a 225-unit multi-family building and around 103,870 square feet of other uses. Block B would include a 225-unit multi-family building and around 260,000 square feet of office space. The 14-story office building is the tallest in the development. The plan for blocks C and D is more flexible, with a mix of multi-family units and townhouses proposed. Overall, the residential portion of the development would serve up to 1,500 residents. The applicant is also seeking a 21 percent reduction in the number of required parking spaces. State law allows reductions if proposed development has high density and is nearby a current or planned Metrorail station. 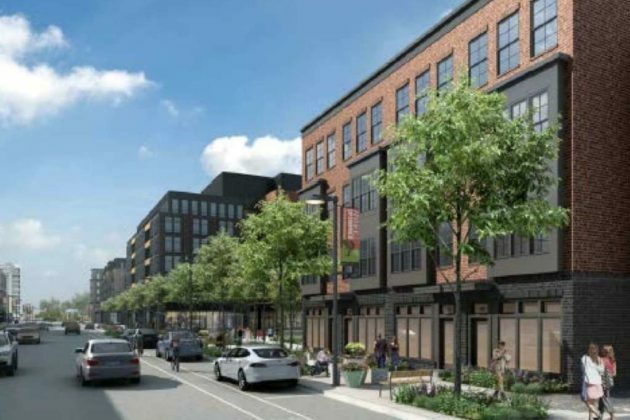 In an Aug. 30 report, staff from the county’s Department of Planning and Zoning said the location of townhouses along Reston Station Boulevard is “a central site design concern.” Reston’s comprehensive plan envisions the street as a main street with ground floor retail. The report also notes that lawns for townhouse owners are so small they may be hard to maintain. In addition to contributions to the county’s road fund, the applicant will provide $40,000 for four new traffic signal preemption devices near the development and around $1.5 million for the county’s school fund. Estimates indicate the development would generate between 123 and 148 new students. The Midline project adds itself into a mix of approved and in-progress applications near the Wiehle-Reston East Metro Station.